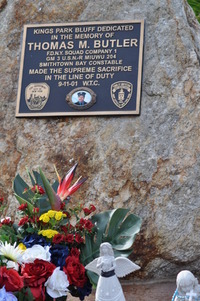 In my continued participation in Project 2,996, a tribute to the 2,996 innocent victims of 9/11, where bloggers eulogize each victim, today I remember Firefighter, Thomas M. Butler. Previously, I have remembered Capt. Daniel J. Brethel, Pamela Chu, Donald H. Gregory, Steven Harris Russin, Lt. Col. Jerry Don Dickerson Jr., Mary Lenz Wieman, Mark Francis Broderick, Capt. Patrick J, Brown, Hagay Shefi, Alison Marie Wildman, Daniel Thomas Afflitto, and Donna Bernaerts-Kearns. Please visit my tributes to them as well today, as they deserve to be remembered too. 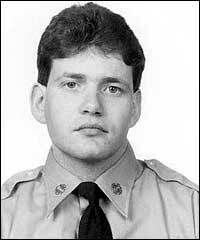 Firefighter Thomas M. Butler was a member of FDNY Squad 1. Tom's life was dedicated to service. A 12 year veteran of the FDNY, Thomas was also a former NYPD Officer and a member of the US Navy Reserve, assigned to the Mobile Inshore Undersea Warfare Unit. He also served as the bay constable in Smithtown‚ N.Y.
As Tom's wife wrote in 2006, "Everyday was important to him and he lived it like it was his last." His laid back attitude was epitomized by him constantly reminding his family and friends to "Don't sweat the small stuff!". Tom and Martha had three children, Kelly, 4, Shawn 6 and Patrick 8 months. On September 9, Patrick and Martha christened Patrick. Tom, true to his fun-loving nature, wanted a big party. Martha protested. Tom won out. Tom bought a new suit just for the occasion. This turned out to be the last time many of their family and friends saw Tom. One could hardly imagine a better, more tributing farewell to someone like Tom, than a large family party. As I write this, my family is planning a Bat Mitzvah for our daughter. Like Tom, I will be planning a big party for her, and yes, I will be buying a new suit as well. 1 Patrolman from the New York Fire Patrol all died. Yet the FDNY and NYPD keep adding names to the list of fallen heroes. Since 9/11, more than 150 firefighters have died of cancers caused from their time at the site. Just his year, more than 500 NYPD and FDNY officers were diagnosed with new cancers. This is unacceptable. The fact that Congress took so long to pass the Zadroga Act is disgusting. The fact that they let it lapse in 2015 is despicable. That they reinstated it for 75 years is at least promising. Why it is not permanent, is beyond explanation. In my continued participation in Project 2,996, a tribute to the 2,996 innocent victims of 9/11, where bloggers eulogize each victim, today I remember Capt. Daniel J. Brethel. Previously, I have remembered Pamela Chu, Donald H. Gregory, Steven Harris Russin, Lt. Col. Jerry Don Dickerson Jr., Mary Lenz Wieman, Mark Francis Broderick, Capt. Patrick J, Brown, Hagay Shefi, Alison Marie Wildman, Daniel Thomas Afflitto, and Donna Bernaerts-Kearns. Please visit my tributes to them as well today, as they deserve to be remembered too. FDNY Captain Daniel J. Brethel, of Ladder 24, was living his dreams. He was a firefighter. Something he had always wanted to be growing up on East Meadow, Long Island. His brother remembers him as a 4 year old with a red firefighter hat and playing with firetrucks on Christmas Morning, He would listen to his emergency scanner and often beat firetrucks to the scene on his bicycle. At age 18, Daniel joined the East Meadow Fire department as a volunteer. At age 21, he joined the FDNY and asked to be placed in the City's busiest area, the South Bronx. 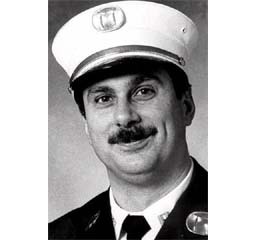 It was said that he had two families: his wife and daughters who where his life, and his FDNY family. Capt. 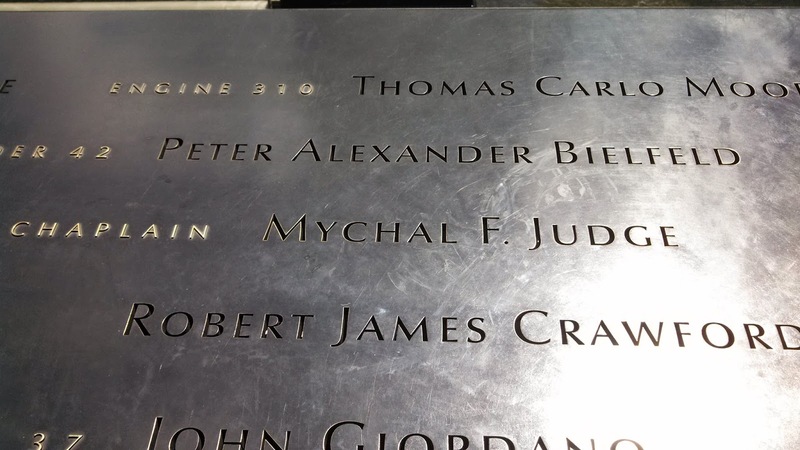 Brethel was supposed to be finishing his shift on September 11. But like the hero firefighter he was, he accompanied his ladder company to the World Trade Center that day. It is believed that Capt. Brethel died while trying to save a fellow firefighter by pulling him under a firetruck. They were both crushed. That sense of sacrifice was not unusual for Capt. BREthel, who earlier in his career was severely burned on his neck and ears after taking off his helmet to save a fellow firefighter until medical personal arrived. Usually I chose the person I eulogise randomly, from a list maintained by the Project 2,996 website. A few times I have selected a name that I wanted to remember, such as Steven Russin, who lived on my street, and for whom the Town of Marlboro named my street for (much like the town of East Meadow did for Capt. Brethel. However, this time I purposely picked a firefighter to remember. New York's Fire Department lost 349 members on 9/11 An additional 159 have died since from 9/11 cancers, including 32 members who were recently added to the Fire Department Memorial. It is for this reason that we need to make the Zydroga Act permanent. We need to expand it to all persons who were at, near and around Ground Zero on that day, and the following days,weeks and months. Our firefighters sacrificed their lives, and those that survived are still sacrificing their lives without proper medical treatment. I have helped victims file their claims with the victims compensation fund. However, many more have not filed, and many more do not know that they have become eligible to file for health care and health services, because the laws have changed, and more cancers and other diseases have been added. Please, if you or someone you know was there, or around the site, please file. There are bar associations and pro bono clinics that will help you if you can't do it yourself. 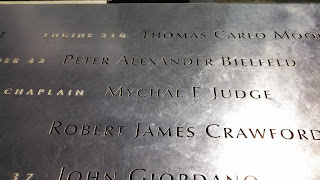 In my continued participation in Project 2,996, a tribute to the 2,996 innocent victims of 9/11, where bloggers eulogize each victim, today I remember Pamela Chu. Previously, I have remembered Donald H. Gregory, Steven Harris Russin, Lt. Col. Jerry Don Dickerson Jr., Mary Lenz Wieman, Mark Francis Broderick, Capt. Patrick J, Brown, Hagay Shefi, Alison Marie Wildman, Daniel Thomas Afflitto, and Donna Bernaerts-Kearns. Please check out these tributes as well today, as they deserve to be remembered too. Pamela was a 31 year old Vice President of Cantor Fitzgerald, the bond trading firm located in the World Trade Center, that lost so many people on 9/11. Pamela was described as "beautiful, intelligent, modest, full of life, aggressive and honest." Her friend Christiana Yu said of her "I never saw her stressed out, but she told me about customers barking, `This is what I want. Don't sell too low. Don't buy too high.' And there was a lot of trading going at one time. And she was the only female trader and only Asian in her department, and that was difficult, but she seemed so relaxed." In the months leading up to 9/11, Pamela moved from her parents' home in Queens to a recently renovated rental apartment five minutes from her office. By doing that, she said, she could get to work by 6:30 a.m. That is was the dedication that she showed to her job. Pamela enjoyed traveling and cooking. Every year for Thanksgiving, Pamela made the turkey and all the trimmings for the entire family. She was a really good cook. Her aunt and uncle did not particularly like turkey, but once they tried the exceptional turkey Pamela made, their minds changed forever. It will never be the same without Pamela celebrating the holidays. Pamela was born in Korea, and with her parents she moved to the United States when she was 2. After graduating from the University of Buffalo, she started working for Cantor Fitzgerald as a temporary clerk, working her way up to Vice President.